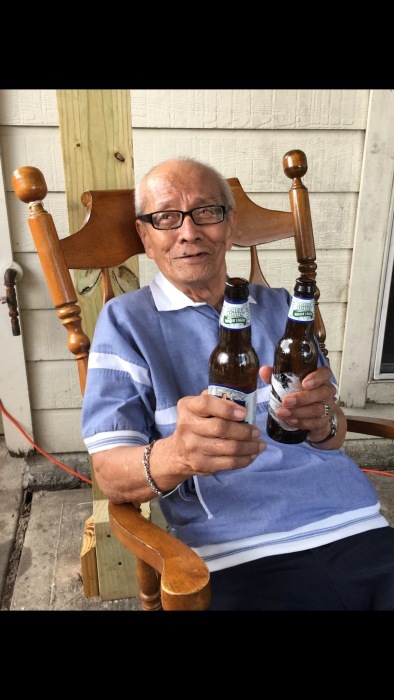 Pedro “Peter” Apigo, age 90, passed away peacefully on Sunday, April 14, 2019 at Harbor Hospice in Houston, TX. He was born February 19, 1929 in Cadaclan, San Fernando, La Union, PH, the third of eight children to Balbino Apigo and Silberia Lubrin. Pedro spent two years in Vietnam before retiring from the Philippine Army in 1975. He and his wife moved to the United States in 1991 to help care for their grandchildren. He is preceded in death by two of his children, Edgar Apigo and Cynthia Apigo. He is survived by his wife of 63 years, Crisanta; his daughter, Vilma Sherry and her husband, Albert; 5 grandchildren, and 3 great-grandchildren. Friends and family are invited to the viewing at Unity Funeral Home at 7730 Boone Rd on Wednesday, April 17, 2019 between 4:00 p.m. - 9:00 p.m. The deacon will lead the rosary at 7:00 p.m. The funeral mass will be held on Thursday, April 25, 2019 at 11:00 a.m. at Notre Dame Catholic Church, 7720 Boone Rd. There's still time to send flowers to the Funeral Mass at the Notre Dame Catholic Church at 11:00 AM on April 25, 2019.